The Denali Highway was completed in 1957 to serve as the access route to the Denali National Park. The route catered to the motorists who arrived from the south via the Alaskan Highway as a straight path route to the Park. The popular automobile tourists of the post WWII era were the target users; however the Alaskan Highway and the Denali Highway were not paved and subject to harsh conditions and made for a demanding trip. In 1972 the famously paved Parks Highway was completed to provide “civilized” motor access to the Park and for this highway Anchorage was the starting point; air travel had changed how people vacationed to the great state. 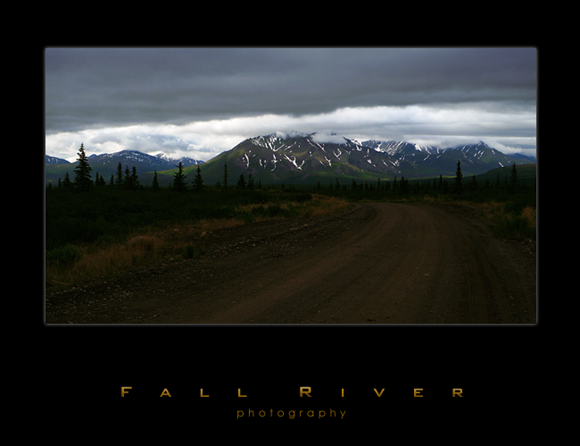 This entry was posted on Wednesday, June 17th, 2009 at 5:21 pm	and is filed under Landscape and tagged with Denali Highway, Denali Hiway, fall river photography, the denail. You can follow any responses to this entry through the RSS 2.0 feed.